The new Beumer bag-in-bag system now packs filled paper bags individually or in groups with a weather-resistant plastic film. 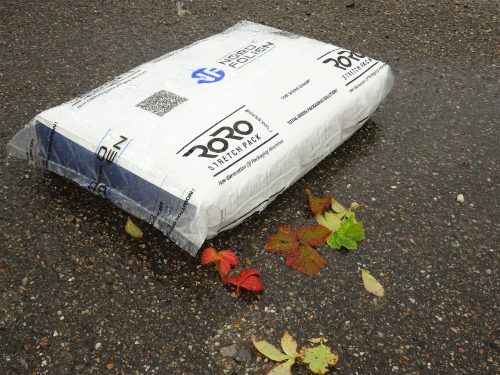 The impermeable film keeps dust from escaping from the filled bags, and it prevents product losses. It has thicknesses of 30 to 100 microns, thus lowering material costs. Meanwhile, the outer packaging in the paper bags does not require an intermediate layer made of polyethylene without requiring ultrasonic welding of bags. The bag-in-bag technology, offered in cooperation with Tentoma, is suitable for goods with lengths of up to eight meters and product circumferences of 600 mm to approximately 5,600 mm. The system can also be used for bar stock, insulation materials or consumer goods. It can be installed in existing feeding line while supplementing the Beumer fillpac inline packer and the Beumer paletpac high-performance palletizer. The bag-in-bag is designed for inline packers with a capacity of up to 800 bags per hour. The system can be configured for three different applications: a semiautomatic insular solution, a fully automatic depalletizing, packaging and palletizing line, or an integrated solution in which machines can be switched on individually.